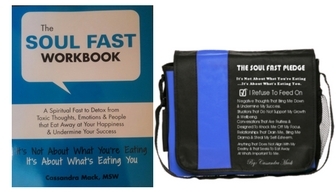 The latest version of SOUL FAST WORKBOOK is now available in paperback from my website: StrategiesForEmpoweredLiving.com. This offer IS ONLY AVAILABLE ON MY WEBSITE Strategies For Empowered Living when you purchase the newly released Paperback version not the e-book. 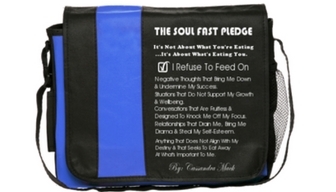 THE LIMITED EDITION SOUL FAST MESSENGER BAG has The Soul Fast Pledge written on it as a reminder to only embrace that which grows you, builds you up and leads to increased fruitfulness and better wellbeing.